Here is another “classic” review from the days of yore! Enjoy! Packaging: It’s minimal, it holds the figure in, keeps it relatively safe from damage, and tells you what it is. It does it’s job, even if it’s not the most eye-catching package out there. *Snicker* For those that just rip them open anyway, like me, who really cares? Sculpt: Wonderful! Great details, and most of the figure is a kind of rubber, which makes it easy to move things around if needed. 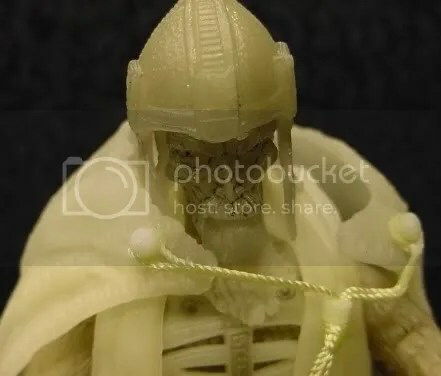 His withered face has every little detail, his armour is perfect down to the chain links of his “skirt”. I’m very impressed. The only thing that looks funny is if you remove his cloak, his ball joint shoulders look a bit odd. Articulation: Way more than I expected, but up to par with most Toy Biz figures. Paint: this is the one place I was dissapointed. There are really no paint apps here. There is a crappy wash put on there to help bring out the detail, but I think it would have been better to actually paint the details in. I probably will sometime, but I shouldn’t have to. Accessories: He comes with a helmet, which not only fits on his head, but looks good and in proportion at the same time. 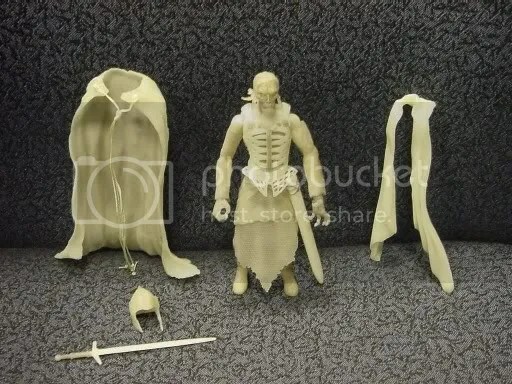 He also has his sword with scabbard, his cloak, and a sculpted cloth type thing that I think is supposed to be part of his robes. With all his robes and cloak on, it hinders his posability a bit, but it’s not that big of a deal. If you leave his robes off and cloak on, it works pretty well. 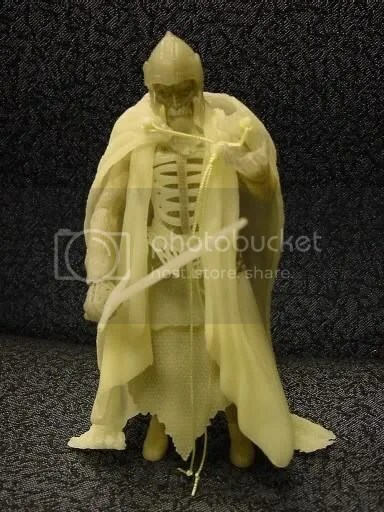 Action Feature: This dude glows in the dark. I haven’t tried him in pitch dark yet, being he’s on my desk at work right now, but I stuck him in a darker corner of my work area, and he glew quite well. I’m sure in the pitch dark he looks quite awesome. Disaster (or minor annoyance) strikes! This figure also marks the first time I have had a Toy Biz figure break on me right out of the package. As I was trying out his wrist swivels, the left hand twisted right off. 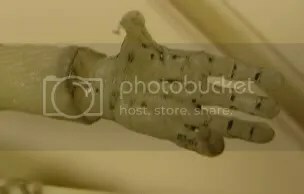 I jammed part of a paperclip in the stump and into his hand connecting the two and Viola! It’s good as new! 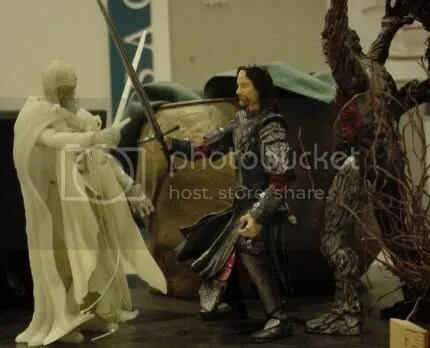 I have heard many QC concerns with LOTR and Marvel Legends in this regards, so I guess it was bound to happen to me sooner or later. My opinion: All in all, I am very happy with this figure. Toy Biz is my absolute favorite toy company right now, due to the properties they have, the prices they charge, and the level of care they put in to their figures bridging the gap between kids and collectors.